We reported earlier this month that production has started on Season 2 of Marvel's Daredevil, and we already know that there will be plenty of new characters added to the superhero TV series. Jon Bernthal has signed on to play The Punisher, with Elodie Yung joining the cast as Elektra. Last week, the official Twitter account for the hit series released a cryptic new photo that could hint at the presence of another character from the Marvel comic books. In Season 1 of Marvel's Daredevil, which is currently streaming on Netflix, Matt Gerald portrayed Melvin Potter, who designed the iconic crimson costume that Matt Murdock (Charlie Cox) finally puts on at the end of the season. 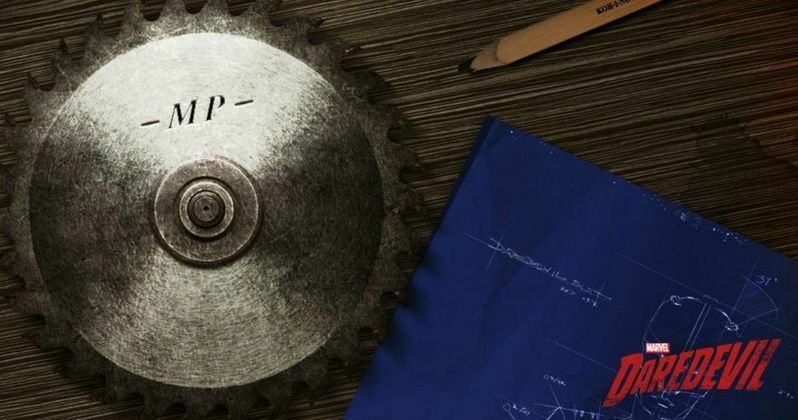 The streaming service released a photo that featured a circular saw blade with the initials MP and the designs for Matt's costume, along with one of his Season 1 dialogue lines, "I gotta be good. So I make things. I'm good at making things." This could be a hint that Potter follows in his character's comic book footsteps and transforms into the villainous Gladiator. The character's presence has not been officially confirmed by Marvel or Netflix yet, but in the comics, Gladiator battles Daredevil by wearing thick armor and using wrist-mounted circular saw blades. Fans got their first look at Potter in the Season 1 episode "Shadows in the Glass", where it was revealed that he was making armored suits for Wilson Fisk, a.k.a. Kingpin (Vincent D'Onofrio). In "Path of the Righteous", both Matt and Melvin went at it, where fans saw a glimpse of Melvin's Gladiator persona after he threw a saw blade at Matt. After Matt emerged victorious, Melvin admitted that he was only working for Kingpin so a close acquaintance named Betsy would not be harmed. They eventually teamed up, with Melvin designing and creating the crimson red Daredevil costume, first seen in the Season 1 finale, entitled "Daredevil". If Daredevil Season 2 does feature Gladiator, it isn't known how that will play out, since the first season ended with Matt and Mevlin on good terms. It's possible that Kingpin could break out of prison, getting revenge for Melvin turning against him and forcing him to take on Daredevil. Season 2 of Marvel's Daredevil won't debut until sometime in 2016, so we'll have to wait and see if more details regarding Gladiator arrive between then and now. Do you think the Gladiator will surface this season on Marvel's Daredevil? Or will Matt have his hands full dealing with The Punisher? Let us know what you think, and stay tuned for more on the upcoming season.